The Steel Crown is the official publication of the North American Araucanian Royalist Society. 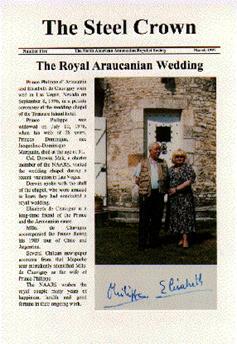 It provides reliable English-language information about the history of the Kingdom of Araucania and Patagonia, the current activities of the Royal House of Araucania, and reports regarding the Mapuche people. Back issues are available from the General Secretary for $7.50 each. Monkey Puzzle Tree Harvest by William Moult. This article discusses the pine nut harvests in Araucania. Ethnomaniac's Bucket of Bile by Fernando de Pierris. This article reviews Francois Lepot's 1995 work, El Rey de Araucania y Patagonia. Everything You Ever Wanted to Know About Guinea Fowl, by Prince Philippe d'Araucanie is a translation of portions of a cookbook written by the Head of the Royal House of Araucania. The Council of the Kingdom of Araucania and Patagonia, by Don Jean-Michel Parasiliti di Para, Duke of San Pedro de Hueyusco. This article offers an inside view of one of the surviving institutions of the Araucanian monarchy. The Opera of Guillermo Frick and the Araucanian National Anthem by Dan Morrison. This article investigates the fabled opera about Orelie-Antoine de Tounens and its status as the Araucanian National Anthem. Open Letter from the Director of the NAARS, Chev. R. B. Shull, K.C.S.J. Among the Mapuche Indians of Aaraucania, by Robert Young, F.R.S.G.S. The Orders and Decorations of the Kingdom of Araucania and Patagonia, by Commissaire-General R. Stiot.